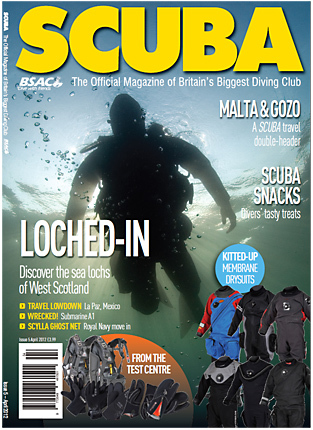 The magazine also features an article I wrote on diving Scottish sea lochs. SCUBA have used one of my images for the front cover of the the April 2012 magazine. The magazine also features an article on diving Scottish sea lochs which is illustrated with both my underwater and topside pictures. The cover shot is from Stoney Cove and is a silhouette of diver Rob Bailey, who graces the front cover for the second month in a row.